A new set of videos have been released by Michael Reichmann and Jeff Schewe providing an advance guide to the new features within Lightroom 5. Many will be familiar with previous releases from the duo which have covered every Lightroom version from LR1 beta onwards. These have proved a popular resource for those hoping to gain a deeper insight to the workings of Adobe Lightroom. This release is slightly different from the rest and a clue is in the title. It’s purely an advanced guide, so not aimed at beginners, and only covers the additions made to Lightroom in version 5, so does not, as in previous releases, include the entire package. This makes good sense however, as the release cycle by Adobe has been reduced from around 18 months to 12 months and the number of major function changes reduced accordingly. For those wishing to learn from scratch then they are advised to purchase the Lightroom 4 Guide which is offered as part a discounted bundle. What’s Included in the Download ? So what to you get this time around then? Well, you get 14 videos to download, which include an Intro and Wrap-up video. If you also discount the 30 minute long interview with Adobe’s Eric Chan, you really are left with just 11 instructional videos. However, in total these run for just shy of 1½ hours. The videos were recorded with Michael and Jeff using an RC (release candidate) version of Lightroom 5, not the official release version. You may think that a bit of a cop-out, but not much has really changed and these guys know and do mention where things may look or work slightly differently. If you’ve not watched video’s from Michael Reichmann and Jeff Schewe before you’ll find them rather different to the usual screen cast variety. The filming has both guys seated behind a desk with their laptops on top, and is conducted in a rather casual manner. There is lots of banter. It’s perhaps more akin to a professional You Tube presentation, but don’t be mislead by the relaxed style, as a wealth of information is presented to the viewer this way. Jeff (with his Adobe insider knowledge) is generally the technician, providing intricate details of how a function may have come about and how it works, whilst Michael typically plays the layman asking the questions the user would want to know, and on the odd occasion, preventing Jeff from baffling the viewer with too much tech talk. This works well whilst also being very informative. I find them enjoyable to watch and there is no doubt Jeff and Michael make an exceedingly good team. However, this jovial style of presentation may not find favour with all. Following the Intro, the first video (rather surprisingly) kicks off with Smart Previews. This comes before a video on Upgrading Your Catalog which may have seemed a better place to start. This explains how you can now take your whole catalog on the road in the form of Smart Previews and still make edits to your images without having to have your RAW image files with you. The third deals with Upright or Perspective Control as Michael recons it should be called, and we are left in no doubt (well certainly in Jeff’s and Michaels opinion) that Upright is the headline new feature in Lightroom 5. This came as a surprise to me. As much as I like Upright, you could achieve the the same result manually before. For me, by far the most important new feature (and by some way too) and is the Advance Healing Brush. Upright gets a full 17 minutes however, and includes a spell in downtown Chicago shooting skyscrapers images that they later work upon. Shorter video’s are presented for minor features such as ACR Integration, DNG Validation and the Map module, with longer, more in-depth videos on the Radial Brush, Spotting and Advance Healing Brush. One particularly interesting video is entitled JDI’s, which stands for Just Do It; Adobe’s terminology for minor feature improvements that have been on a list waiting to get done. Whilst these are minor, and perhaps deemed less important changes, some are actually pretty hard to find. Good stuff here. A bonus video includes a 30 minute interview with one of the Lightroom team lead software engineers, Eric Chan. Unlike the previous studio interview, this one is a video conference conducted online. This tends to ramble somewhat but you do get to find out some of the forethought and development behind the new functions to Lightroom and some hidden features too. In the past I’ve had no hesitation fully recommending any Lightroom videos from Luminous Landscape, this release however, is a slightly different beast. There are far less new features to cover in Lightroom 5, and if you’ve spent time using the beta version then you may be quite familiar with most and see no need for additional tuition. Besides there are also plenty of free videos on these new features to be found online. Whilst still very informative, I can’t help feeling the guys lacked a little of their usual panache in this release. In one Jeff twice apologises for not having his tilt-shift lens and although there are two highly informative videos on Smart Previews neither addressed how you actually go about creating them. I am of course, being rather pernickety, as these guys are some of the best informed when it comes to Lightroom. If truth be told, no matter how experienced you are with Lightroom I can almost guarantee you will find something you didn’t know in here. 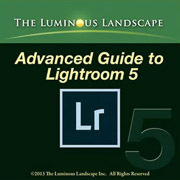 The Advanced Guide to Lightroom 5 by Luminous Landscape is currently on offer at $19.99 (a saving of 20%). You can find a PDF of the full contents here. It’s also offered with a further reduction of 15% if purchased with the complete Lightroom 4 package including the Lightroom 4.x Upgrade & Eric Chan Interview. By my reckoning that’s around $79 which makes this a rather pricey package, and almost as much as the Lightroom Upgrade itself. These videos are not best suited to those new to Lightroom, but for any intermediate and advanced users who wish to quickly get up to speed and gain a deeper understanding of Lightroom 5 then these may indeed prove quite rewarding. Recommended viewing if you’re not deterred by the price.